The tinge of Fall is not yet in the air, but the Back-to-School sales are nearly over, and the big, yellow buses are rolling. Whether you have school-age children or not, your Facebook feed is filling up with adorable pictures of children ready to start on their next educational adventure, and the traffic is getting back to pre-vacation levels. School has changed since we were kids, and it looks like that change is going to continue. Research from the CDC has found that students need later start times, to accommodate their developing bodies and brains. They just don’t learn as well before 8:30 AM – and 80% of public high schools still start the day before 8:30 am. Slowly, though, schools seem to be getting the message so expect more and more schools to delay their start times to accommodate the CDC’s recommendation. The percentage of upper- and middle-income kids participating in extracurricular activities has steadily increased, while lower-income participation is decreasing. In the 1980’s, the gap was 73% for wealthier students and 65% for lower income students. Two decades later, only about 56% of lower-income students are participating. Crayons? Check. Pencils? Check. Hand sanitizer and tissues? Yes, students are being asked to bring more and more supplies to the classroom. 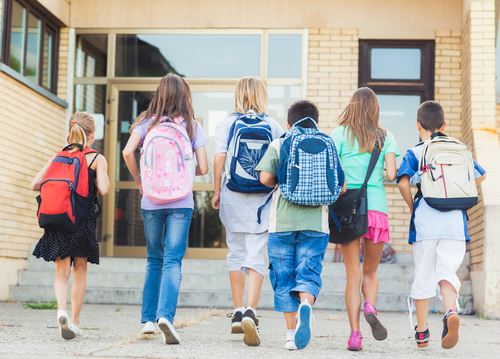 According to the annual Backpack Index, a family with three kids can expect to pay more than $3,000 a year for school supplies and extracurricular activities. And that doesn’t even include what teachers are paying for out of their own pockets. More and more, parents and school cafeterias are focusing on dietary restrictions and the preferences of students by offering more gluten-free, organic, and vegetarian options for lunch. In addition to improved menu items, the serving options are increasing, with some schools offering bistro-style breakfast, smoothie bars, and carving stations. On the flip side of that are the millions of kids who offer free or reduced-price lunches as part of the National Lunch Program. Offered based on students’ household incomes, the number of students eligible for the program is increasing. And when 40% of the school system is eligible, all children are eligible. Parents seem to be holding back a bit on back-to-school spending. This year, parents will spend an average of $630 per child, down from $669 last year. One of the reasons might be that more schools are requiring students to wear uniforms. Currently, 28% of all schools require students to wear uniforms. And that’s increasing, perhaps because parents and students both identify clothing as the most stressful category of back-to-school shopping. As more and more traditional books disappear from schools in favor of PDAs, e-books, and web-based learning, schools are finding less need for lockers. Since those lockers are no longer needed for storage (or for the use of bullies to terrorize underclassmen), many schools are replacing them with charging stations for electronic devices. In addition to changes in curricular requirements – and the uncertain future of Common Core – changes abound for schoolkids. As businesses look to cash in on this market, we would do well to keep these trends in mind.